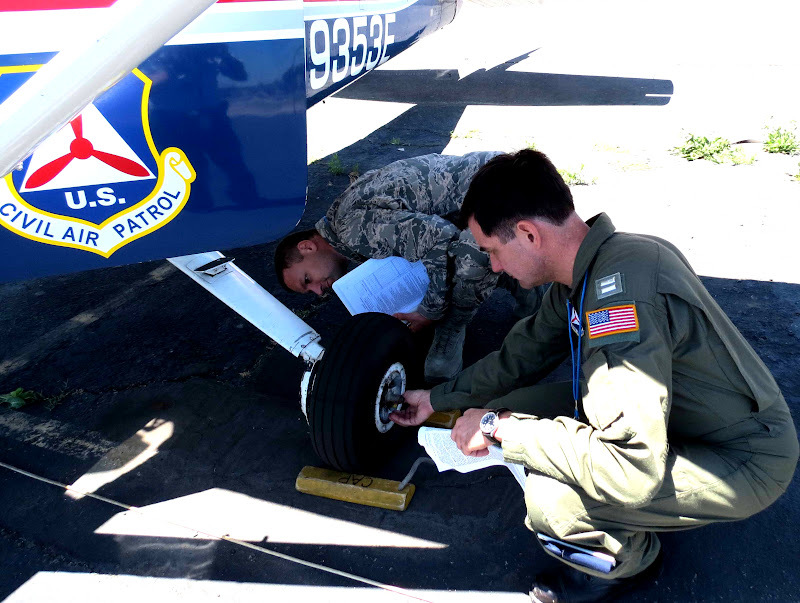 Squadron 188 - The Logbook: California Wing Participates in the Pacific Region “Seismic Survey II” Exercise. 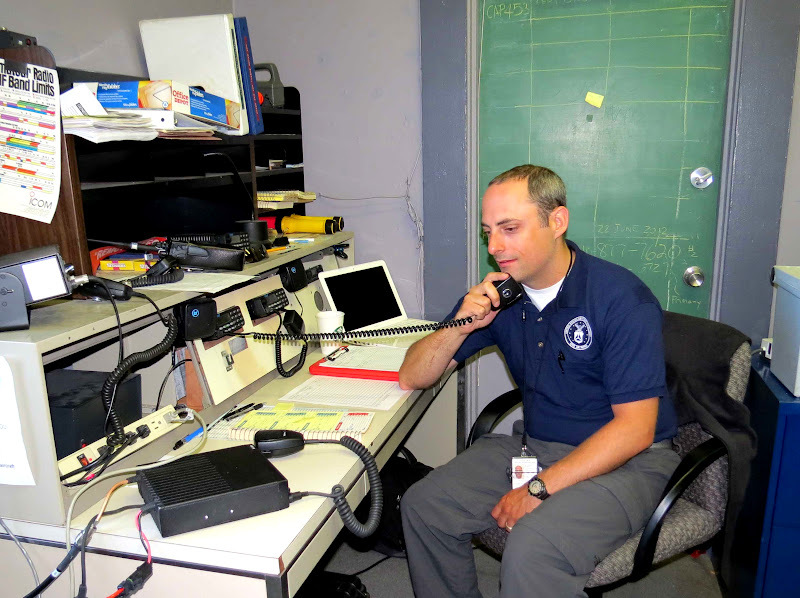 California Wing Participates in the Pacific Region “Seismic Survey II” Exercise. 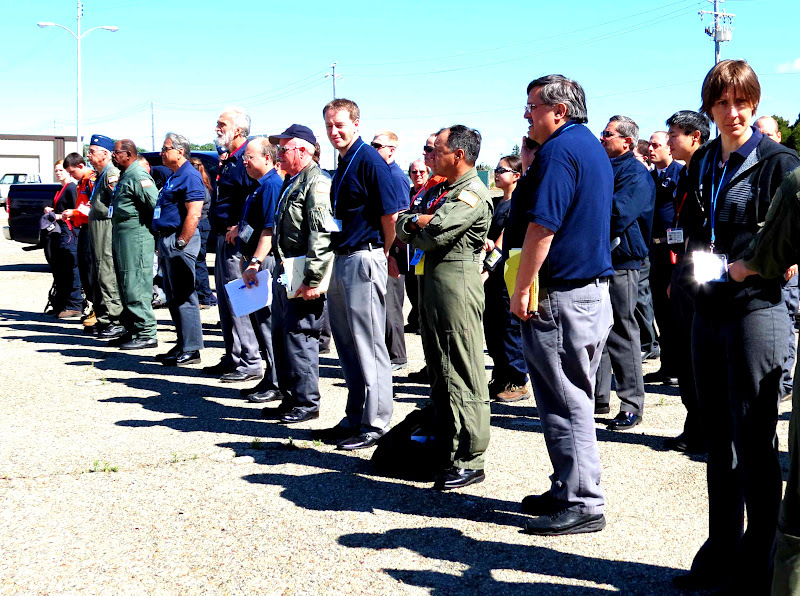 On 24 June 2012 CAWG landed another successful Wing Operations Exercise. The four-day WOX called “Seismic Survey II” was predicated on an increase in seismic activity around the Pacific Rim, and heretofore undetected new volcanic movement. 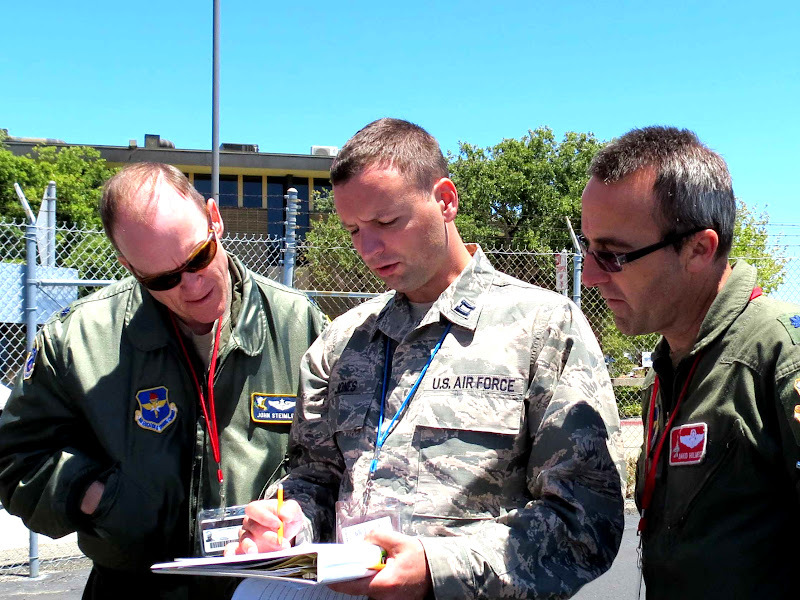 The U.S. Air Force Observer Team review the aircraft inspection form. 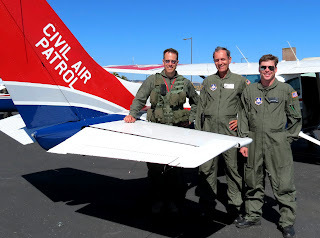 This was not an Air Force evaluated mission (SAR EVAL) for California Wing, but it was for the other two states participating: Washington and Oregon. On Sunday, the final day of the exercise Nevada Wing joined in by lending some communications support to the CAWG aircraft flying over the eastern Sierras. This is the second time that a Pacific Region exercise of this magnitude has been conducted; the first one took place back in July 2006. 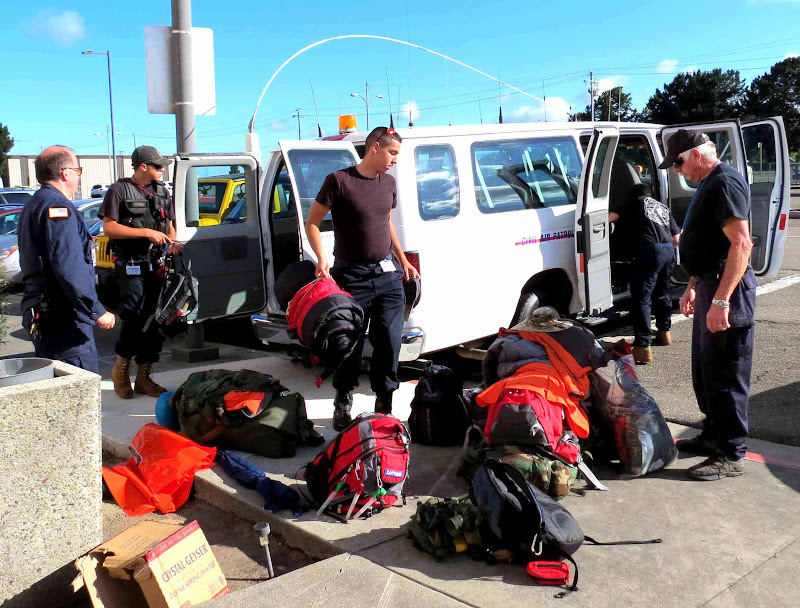 The scale tested the operational readiness of our members and our resources. There were two bases in California. The main command post was located at the Oakland International Airport in the Amelia Earhart Senior Squadron 188. The sub base was located at the Whitman Airport in southern California. was out of the building. 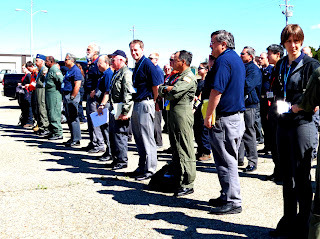 On Saturday morning, the first operational general briefing included evacuation instructions in the event of a “simulated earthquake, volcano or tsunami”. Not even three hours later, a “NO PLAY” emergency occurred. A fluorescent light fixture ballast malfunctioned and started to produce smoke. 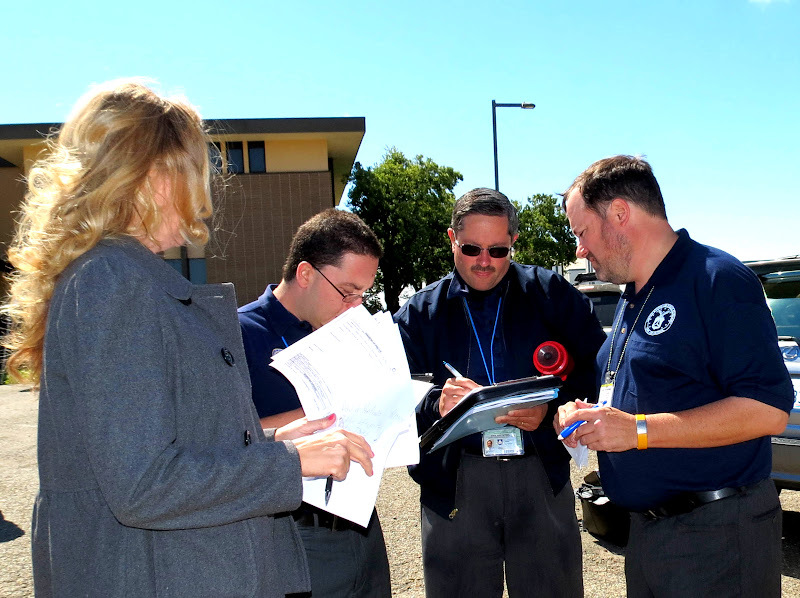 The command post was evacuated; the fire department was called, and everyone assembled across the street in the parking lot which had been briefed as the designated muster location. As instructed in the briefing earlier, everybody “fell in” trying to form straight lines in order to be counted. Cross-referencing the paper lists with an iPad that had the morning’s sign-in sheet it was determined that that everyone was safely out of the building. participants to make sure no one was missing. In addition to using iPads and other mobile technology, the communication team had prepositioned a HF equipped Ford Expedition in the muster parking lot. When the order to evacuate came, they each grabbed a portable radio a clipboard with the paper comm. log, and headed outside to fire up the backup plan. In fact, the switch over was so seamless that crews still in the air did not know about the situation on the ground until they returned to base and heard all the stories. If that wasn’t enough excitement for one event, 30 minutes after the Fire Department had issued the ALL CLEAR, the local Sheriff was summoned. One of the cadets had discovered a small collection of stolen credit cards and ID stuffed into a bush in front of the building. The Sheriff took his statement and returned the property to its owners. Towards the end of the afternoon on Sunday, communication contact was established with Nevada Wing, and a test message was sent: What is the middle name of the pilot? The response came almost 10 minutes later “Tolga flys a Cirrus”. Clearly we still have a lot of work to do! At the conclusion of the exercise, the two bases had launched a total of 45 sorties and logged 104 flight hours. 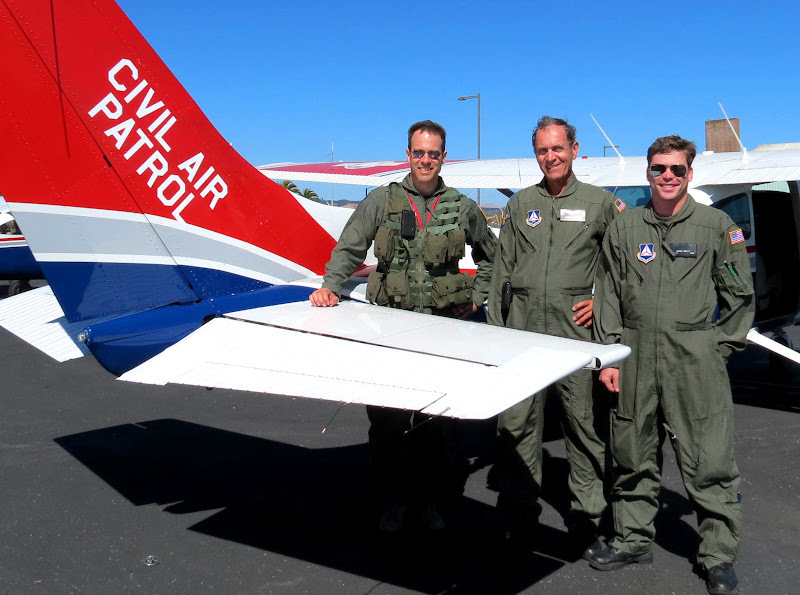 The aircrews delivered photos of 39 USGS targets of seismic interest. We are told that the USGS will compile these images in a database for future study and research. The ground team spent the night on Mount Lassen providing a communications relay to several aircraft operating in the area around Redding. Over the years, we have practiced a number of Exercises together, and we picked up a few tips and tricks along the way which helped this mission to run smoothly. 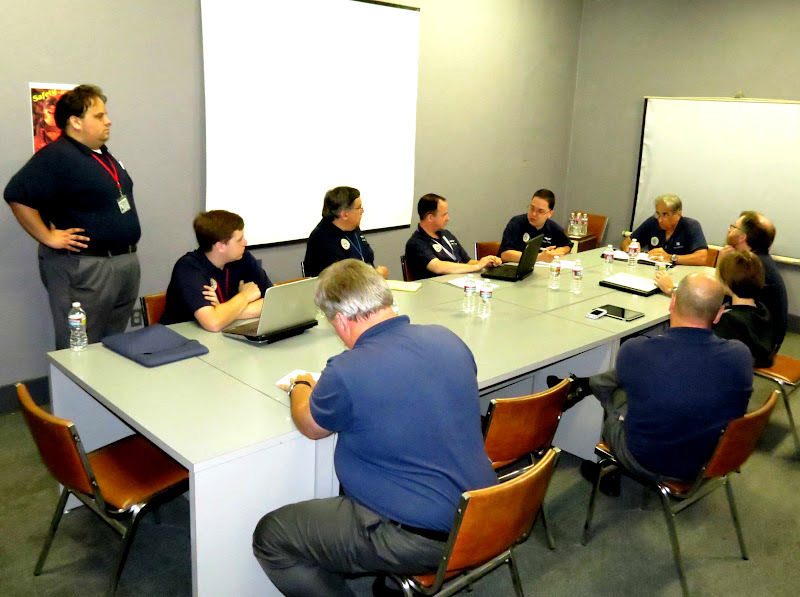 We watched out for each other, used good communications practices in the base, in the air and on the road, and we were courteous to each other and to our customer. It was an excellent training opportunity and one we hope to repeat next year.The Air Force Observation Team let the staff at the Oakland base know that the planning and execution of the whole mission was outstanding. reviewing the events of the day and to approve the Plan for tomorrow. lunching for an overnight mission on Mt. Lassen. 2nd Lt Kelly are ready for departure to their assignment. U.S. Air Force Observer to inspect his aircraft. contact with the aircraft and ground teams.